Networking equipment specialist Linksys is bringing back one of its classic router designs 10 years after it first became a hit. If you're thinking that the company's new WRT1900AC looks a little familiar, that's because it takes a modern spin on the black and blue design worn by the its WRT54G that found its way into living rooms back in 2004. It doesn't share the same internals though: the latest entrant dons 802.11ac compatibility, which provides faster speeds and greater distance over older 802.11b/g/n routers. Inside is a 1.2GHz ARM processor, 128MB of flash memory and 256MB of DDR3 RAM. On the connectivity front there are four removable antennas, alongside one eSATA/USB 2.0 port, one USB 3.0 port, one Gigabit WAN port and four Gigabit LAN ports. In terms of speed, those guts will help you achieve 1.3Gbps on the 5GHz band, or 600Mbps on the 2.4GHz band. In comparison, its decade-old sibling could only manage a paltry 180Mbps. It's a good thing today's plethora of cat videos didn't exist back then - streaming them would've been a nightmare. 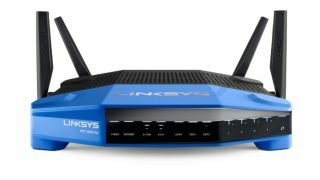 Linksys debuted its first range of Smart Wi-Fi routers at CES 2013, and the WRT1900AC is the latest to take advantage of the tech, which is designed to let owners tweak bandwidth levels based on how much data people consume on their internet-connected devices. The router also comes with mobile support that lets you log in from a tablet or smartphone to change network names, passwords and carry out other maintenance tasks. The Linksys WRT1900AC Dual-Band Wireless-AC router is penciled in for a spring release globally, with pricing yet to be confirmed.